This easy and best watermelon salad vegan recipe is very refreshing, delicious and healthy. It is the perfect summer salad which you can enjoy during the hot days. See romaine lettuce cherry tomatoes salad recipe here, which too is another refreshing simple salad recipe. 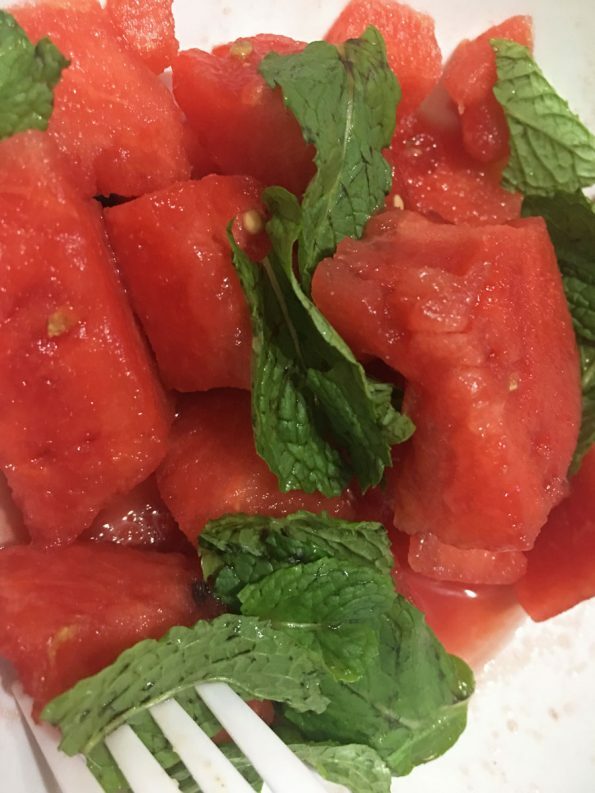 Watermelon is one of the best fruits for making refreshing summer salads which keeps us hydrated and feel refreshed when the days are sunny and hot. Watermelon has got many amazing health benefits and it has an amazing amount of water content. 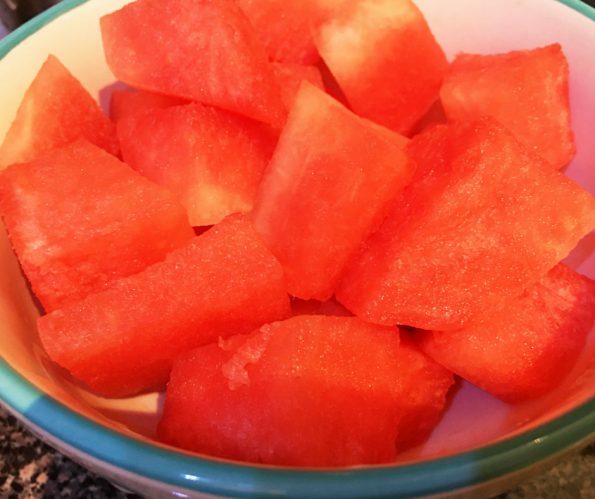 Even a small or medium sized watermelon is large enough to serve many people and you can get many servings of watermelon salad from a single watermelon. This watermelon salad vegan recipe is healthy and delicious and the dressing ingredients makes it more refreshing perfect for summertime. 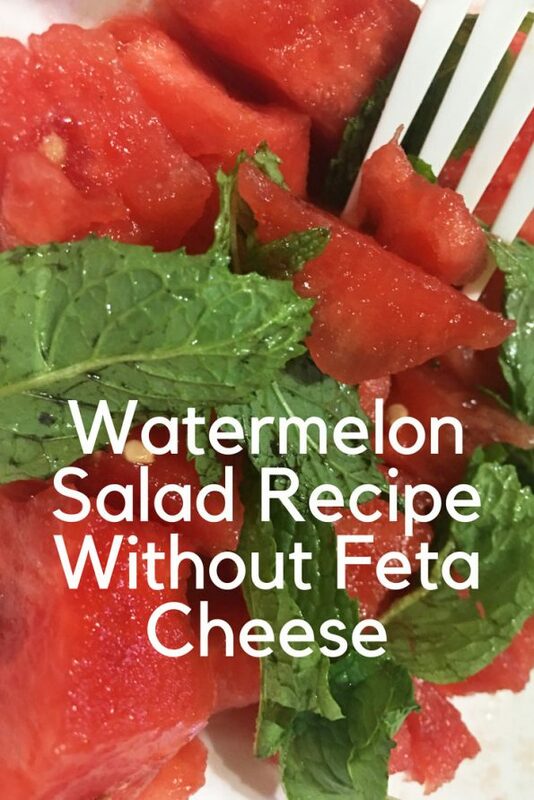 Most of the watermelon recipes I see use feta cheese, which is definitely delicious, but this recipe for watermelon is free of any cheese and uses only vegan ingredients for the simple dressing, so this is a simple and delicious watermelon salad vegan recipe without feta cheese (no cheese watermelon salad recipe). The basic and most important ingredient of a watermelon is nothing else, but fresh watermelon. Always make sure to use fresh watermelon to make watermelon salad and watermelon juice, as the taste of the watermelon recipes will only be good if you use fresh watermelons. Also using cold and chilled watermelon slices will make your watermelon salad more tasty and refreshing perfect for hot summer months. 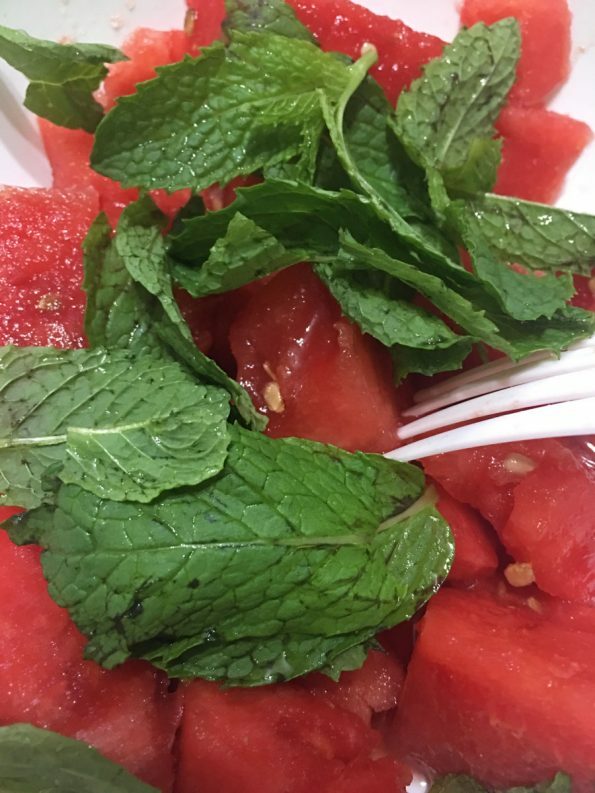 In brief, using fresh watermelon and other salad ingredients (like fresh mint leaves in this case) is crucial to preparing the best salads. 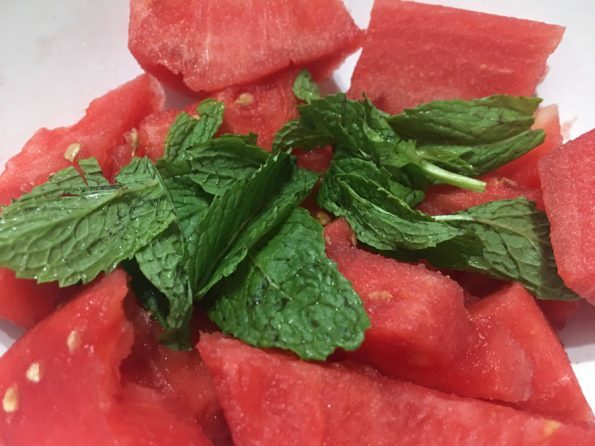 I have used fresh lime juice, ginger juice, a little mint extract and vegan honey along with some fresh mint leaves for this watermelon salad vegan recipe. You can also just use freshly cut mint leaves instead of using any mint extract if you don’t want the extra flavor from mint extract. If you have fresh mint leaves at your home, I highly recommend adding them to this simple salad. You can wash the leaves, chop them up and mix with the salad and garnish with a few mint leaves which are not chopped. You may also just mix in the leaves as such without chopping if you like it that way. Most often, I do not chop the mint leaves when adding to the salad and it is so yummy and refreshing. Adding mint leaves or mint extract will give this salad a wonderful flavor while still keeping it pretty simple and easy to put together. To make ginger juice, just crush a little fresh ginger and filter it. I am not using any nuts in this recipe, but if you want it crunchy, add 2 tablespoons of walnuts or chopped almonds and toss them with the watermelon cubes in the salad bowl, before adding the dressing. 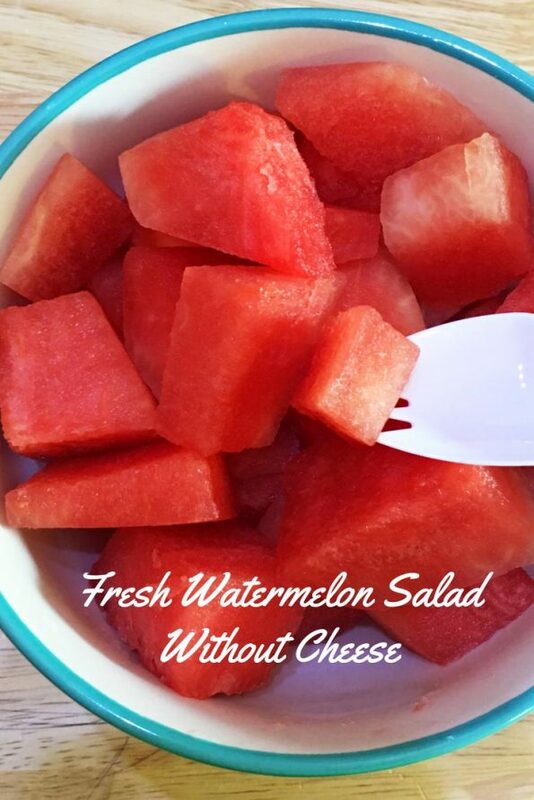 This simple and easy watermelon salad recipe makes one serving of fresh watermelon salad. This easy, simple and refreshing watermelon salad without feta cheese relies on fresh watermelon cubes, mint leaves and few simple ingredients for salad dressing. In a bowl, mix together the salad dressing ingredients - lime juice, ginger juice and mint extract (or freshly cut mint leaves or fresh mint juice) along with honey and salt, keep aside. Transfer the watermelon cubes to a large bowl. 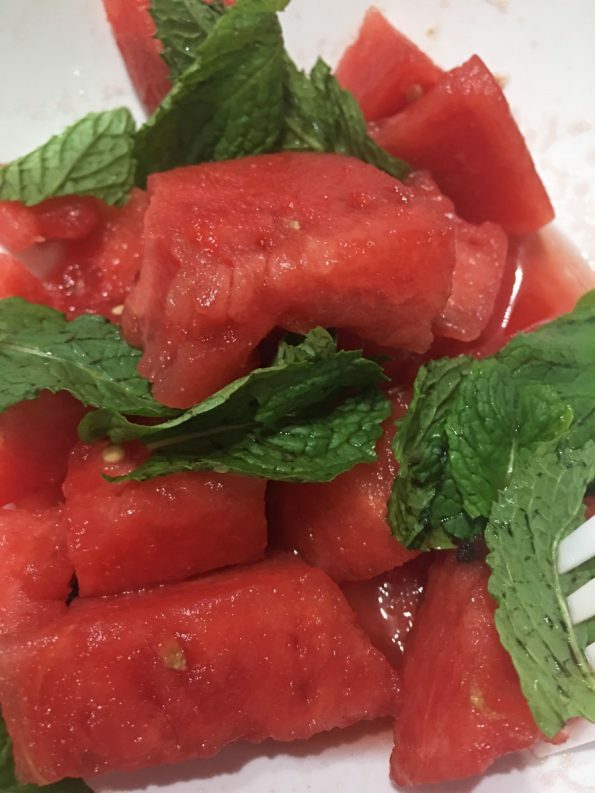 Add the chopped mint leaves to the watermelon cubes and mix in gently. 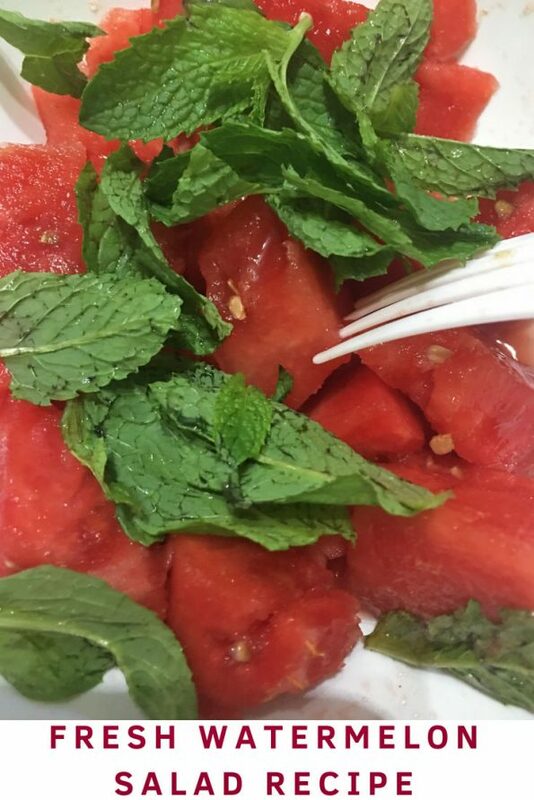 Add the salad dressing to the watermelon mint leaves mix and toss well using a spoon. Transfer the salad with the lime mint ginger dressing to a salad bowl. Garnish with few fresh mint leaves if you like. Serve chilled for best results. If saving for later use, keep refrigerated and use the same day for best results. 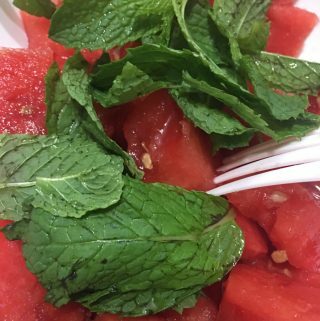 Hope you found this post on watermelon salad vegan recipe with mint and lime helpful!